Should I be excited about this? Strangely I am not… the minis just don’t measure up to their ‘big bros’ IMO. But let’s not underestimate the marketing powers of Jamie Berard… after viewing the video I’ve turned around abit and definitely want one. And what is this nonsense about being available to VIP members?? Over in Asia we have no such programme (yep, we are a neglected bunch) so I hope that means the usual sales via LEGO exclusive stores. • Exclusively available to LEGO® VIP Members! • Authentic miniature representation of first 5 Modular Buildings: Café Corner, Market Street, Green Grocer, Fire Brigade and Grand Emporium! 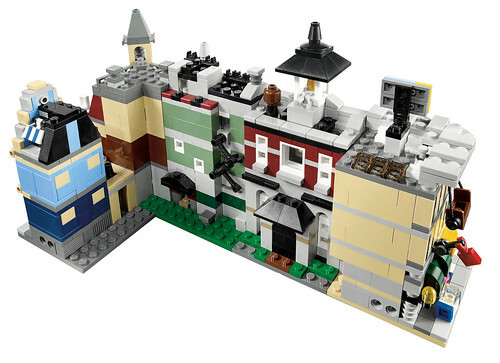 • Each building can be displayed individually or connected to the other buildings in the set! • All buildings feature fantastic detailing and a wide variety of elements and colors! • Completed model measures over 5″ (14.5 cm) tall, 12″ (32 cm) long and 2.5″ (6.5 cm) wide! • Each individual building measures 2.5″ (6.5 cm) long and 2.5″ (6.5 cm) wide! Update: Updated with credits below and clearer pic of the back of the box. Do visit the Flickr link below for new pics of the built set. Enjoy! 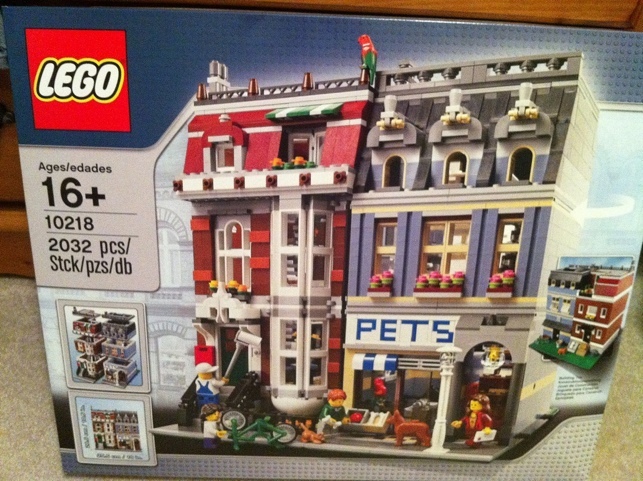 Finally we have the 1st pic of the 2011 modular set, and it looks fantastic! I’m doing a quick blog and run on my way to work so I’ll update with credits etc later but enjoy! Have been checking EB forum for news (erm, leaks). Hopefully the pics will be out soon. You can also read more from my previous post about this 2011 modular set. To ease the waiting to the pictures – some more detailed info about the set (I think it would not harm so close to sale date).Looking forward to buy this set. I like that it has two buildings, so it can be placed between the older buildings. I like the size, as it will be the same as in the case of Market Street building (i.e. 6 studs pavement in the front and 8 studs backyard). The baseplates will be of green color. What I have seen (yes, I did see it), the pet shop building has a lot of the blue color (sides, back side), only the front has so little. The MOC of FollowsClosely is pretty close, well instead of pet shop, as there will be shop window and glass door and next to it will be stairs to the house upper floors(with mailbox, light (no light brick). The brown (with few orange tiles) house will have L-Shaped highest floor with some kind of balcony or how to call it, on the side towards backyard. At backyard will be some stairs to first floor and entrance to the cellar. Animals that I have seen – two parrots, dog (same as in new Police sets) and a cat with lighter color than the dog. 4 figs (one of them child), green bicycle. It seems that there are spiral stairs inside the brown/orange house. Black roof on the pet shop, dark red on the brown/orange one (plus removable flat top). Plenty of flowers at the windows (similar to cookies in Winter bakery). Townhouse has a clever built white bay window. There is a painter painting the trim of the townhouse. The Pet Shop has a clean SNOT sign that reads PETS. You can read more discussions from this EB thread.